I converted a 36 megapixel Nikon D800e RAW file to TIFF and opened it in Photoshop. I then saved the file with each TIFF compression mode both in 16-bit and 8-bit color. I timed how long it took to save each file to my solid-state drive. As a photographer, I’m not only interested in how big the files are, but also how long they take to save. For example, if I’m demonstrating software on my laptop, I might choose options that optimize save speed. Save times for 36MP D800e files saved in 16-bit mode with different compression options. Not only does it take longer to save a compressed TIFF (as you might expect), but using LZW compression actually produces a file that is larger than the uncompressed original! The ZIP compression option took the longest, but reduced the file size by about 16%. Take home message: Using LZW compression on 16-bit TIFFs is not useful. It takes longer and creates a file that’s actually 5% larger than an uncompressed file! ZIP compression is a much better option for 16-bit TIFFs, but be warned that it is a newer format that might not be supported on older software applications. Otherwise, stick with uncompressed TIFFs for the fastest save times. I don’t normally work with 8-bit files, but I include them in this study as a comparison. An 8-bit TIFF from a Nikon D800e runs about 97MB, or half the size of the 16-bit file (as you might expect). I again looked at the various TIFF compression options and I also saved a copy as a JPEG (quality set to 8 in Photoshop). File sizes for D800e images saved in 8-bit color. Here, LZW compression works very well, indeed. The 8-bit LZW TIFF comes in at just under 38MB, a savings of nearly 62%. 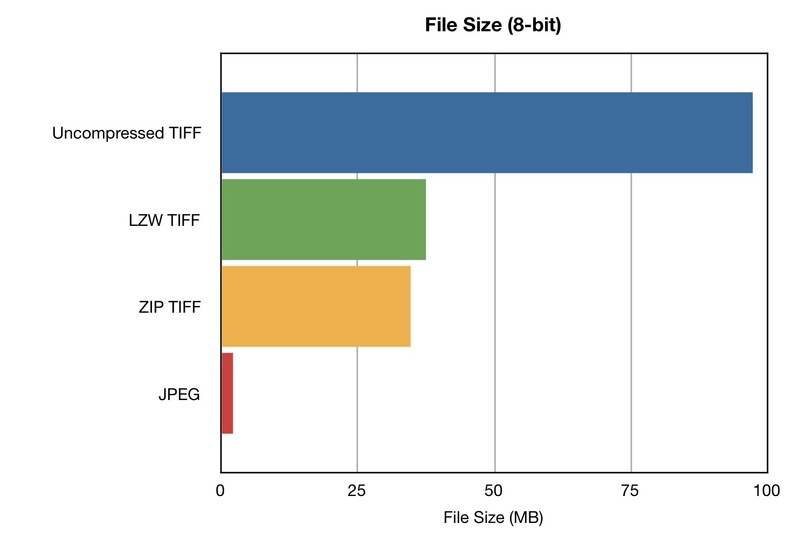 The ZIP file wasn’t much smaller in size compared to LZW compression. However, all of these files dwarf the JPEG, which was only 2.2 MB. However, when you look at the save speeds, it’s clear that ZIP compression of an 8-bit file is extremely slow. In fact, it took nearly a full minute to save the file! 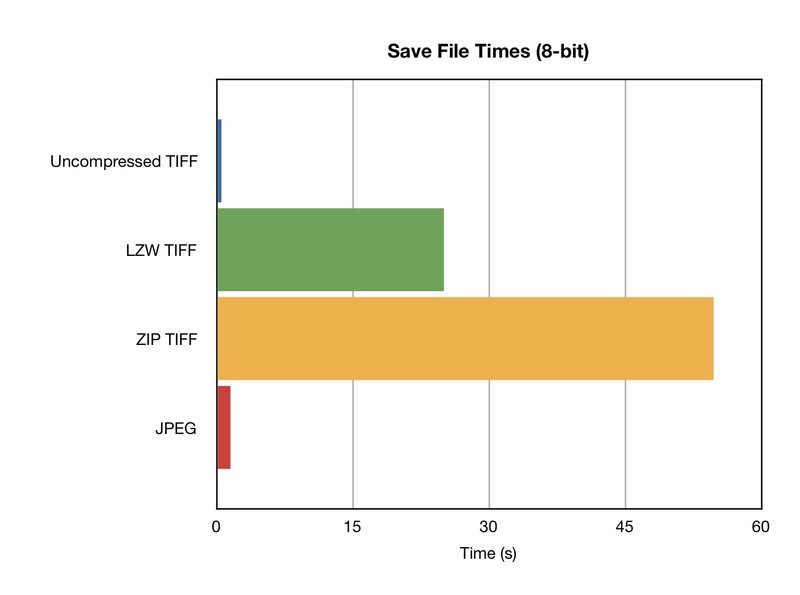 Take home message: If your client wants an 8-bit TIFF, consider using LZW compression for a smaller file. ZIP compression takes significantly larger and doesn’t offer any additional size benefit. 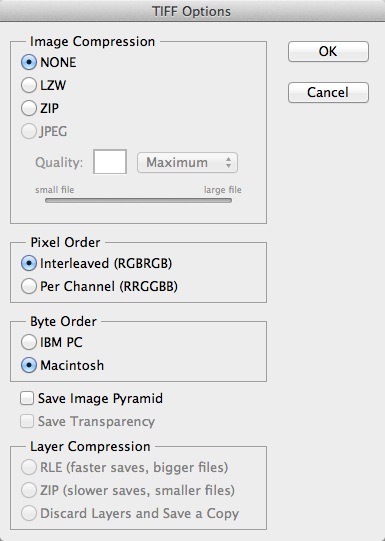 JPEGs are still the smallest file type, but the JPEG format doesn’t support layers. Thank you Jason. Now to try this myself. This was helpful, Jason. I’m getting a negative scanned on a Aztek Premier Drum Scanner, to print onto a board 7 feet wide, as close to 300 dpi as I can get. The Aztek Premier can scan at 8000 dpi (I only need 5500 samples per inch, but the operator can only do either 4000 or 8000). The RGB 16-bit 8000spi scan of my 4×5″ negative will come out to more than 500 megapixels, and more than 6 Gigabytes. I was considering asking the scan operator to save the file with ZIP (Flate) compression to try to get it down to 4.5 Gigs, to get it on a DVD, but now I can see from your measurements that could have taken hours to save it!! We’ll be tansferring the files with a jump drive, I now realize. Thanks for your analysis. I save as uncompressed tiffs until the last save, to avoid multiple-compression-save damage. Doc, compression in TIFF is lossless.. It’s only jpg that is always lossy compression. For others to know, too.. The same goes for DNG compression – it is always lossless, unless you specifically choose the ‘lossy’ option. Thanks for this! 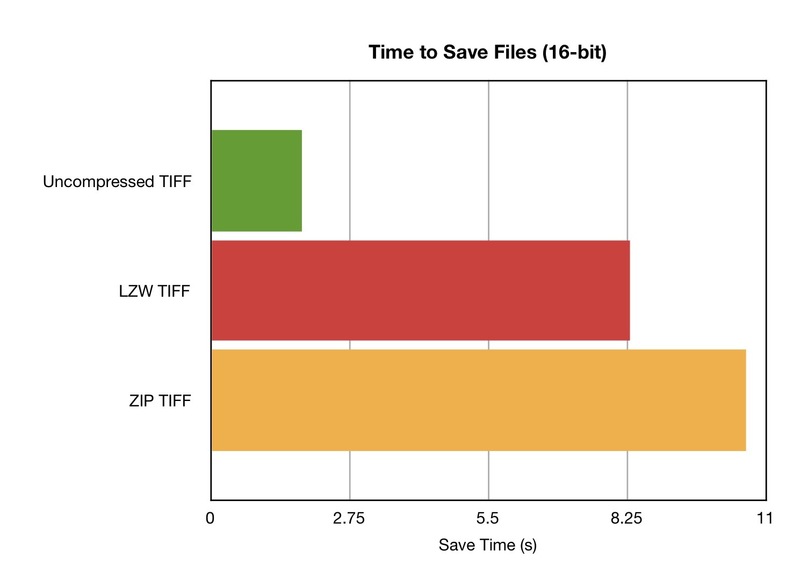 Using LZW over ZIP while saving my 8 bit TIFFs saves me a lot of time! Lynne- TIFF files cannot be split. I recommend making sure your computer has plenty of RAM for image editing. Thank you! I work in the printing industry and am constantly converting files to TIFFs as my large printers process them faster (even if they come out to be larger files that the original). The person who trained me told me to stay away from the LZW compression but never explained why. Why would I choose one option over the other, interleaved or Per channel? I’ve never really looked into that particular detail. I save all my images from Photoshop in PSD format now. For clients requiring TIFFs, you can always ask them if they have any particular formatting needs. Otherwise, I’d use the defaults. I find the best file compressor to be WinZip. I’ve been using it ever since I ran across this guide: http://www.winzip.com/learn/file-compression.html and learned how it works and how it compresses files and leaves the quality intact.